Yet another Welsh narrow gauge railway! 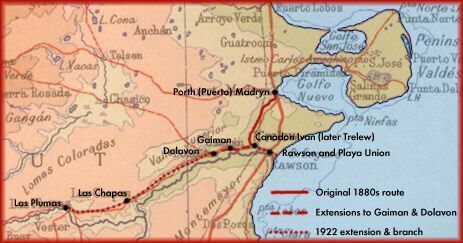 The construction of a railway to link the Welsh villages in the 'Camwy' or Chubut Valley to the sea at Puerto Madryn (otherwise known as Puerto Nuevo or Porth Madryn) was first proposed by Thomas Davies. The idea seems to have been enthusiastically taken up by Lewis Jones, who was obviously something of an entrepreneur. The third of the original proposers was the engineer Edward Jones Williams who surveyed the suggested route. Skinner, in his book about Williams (1) suggests that Jones was the visionary, Davies the businessman, and Williams the pragmatic and practical engineer. An 1884 plan in Gaiman Museum (ironically, itself the old station building) shows a railway line which it was proposed to build between Puerto Madryn and 'Cañadón Ivan', a distance of 37 miles (approx. 59km.). The line was to be single track with a ruling gradient of 1 in 60 (1.66%) and a gauge of one metre. The above map shows the area. The red line which represents the railway starts at Puerto Madryn and runs south to what later became the town of Trelew. On the 20th (25th?) 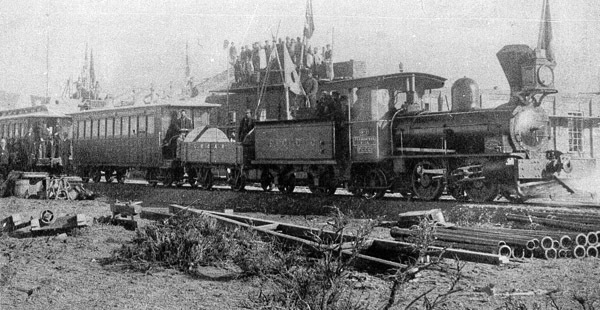 October 1884 by Law 1539 the Argentine Congress authorised the construction of the Ferrocarril Central del Chubut by Lewis Jones y Cía. However it was not easy to raise the necessary capital, for local funds had been exhausted by the canal construction. Eventually Lewis Jones himself went to Britain for materials and labour. He had no luck raising funds in London either. However, whilst accompanying his daughter Eluned by train to Bangor, their talk in Spanish (a means of keeping the conversation private?) aroused the curiosity of a Mr. Asahel P. Bell who was an engineer but more importantly had contacts amongst the business community in Liverpool. Through the latter's eventual efforts the Central Railway of Chubut Company was registered in Liverpool. Whilst the company was authorised to raise £200,000 in £10 shares, only £36,000 was initially invested, almost entirely by the Chubut Company. This was a parent company, having the same directors and filing statutary reports for both companies simultaneously up to 1903. In fact the Chubut Company was contracted to do much of the initial work before the line opened, and it was they who ordered materials such as steel sleepers from Rhymney Iron Co., rails from the Ebbw Vale Co., and turntables from Isca Foundry (1). The Welsh connection will be obviously in the above names, though items such as locos and rolling stock came from across the border (locos from Sharp Stewart and Beyer, Peacock in Manchester, and rolling stock via the agents Bolling and Lowe from an as yet unidentified maker). 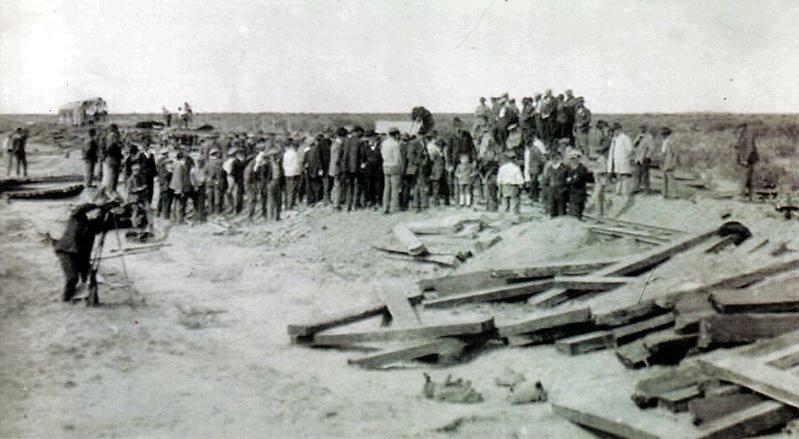 On the 28th July 1886 the steamer 'Vesta' arrived at Puerto Madryn carrying 465 immigrants and materials for the line's construction. 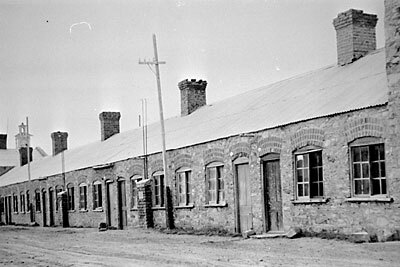 This day was the 21st anniversary of the founding of the Welsh colony. The day before it, coincidentally, was the day of registration of the FCCC company. All significant works have to start with a ceremony, the Central of Chubut was no exception. Rather than a big-wig digging the first sod with a silver bladed spade, a horse shovel was used, drawn by no less than four horses. 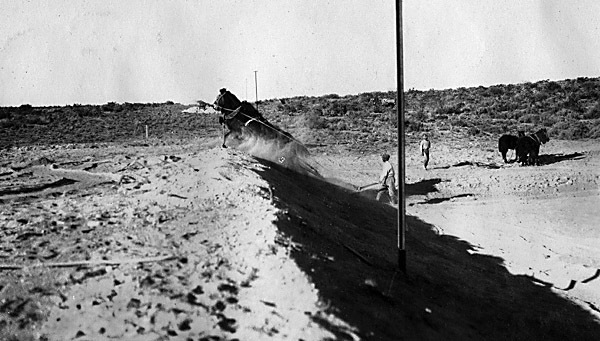 Photos from the collection of the Centro de Estudios Historicos y Sociales in Puerto Madryn showing the 'terraplenes' (embankments and cuttings) under construction. The original engineer who surveyed the line was Edward Jones Williams. A native of Mostyn in Flintshire, he had gone out to Patagonia in 1881 and had distinguished himself in the survey and construction of the irrigation canals paralleling the the River Chubut. He had become involved in the railway from a very early stage when Lewis Jones' proposals were first discussed. When the time came to build the railway this was done directly by the railway company, rather than by engaging a contractor. E.J. Williams was appointed as Constructing Engineer and the terms of his contract have survived and may be seen in an appendix. 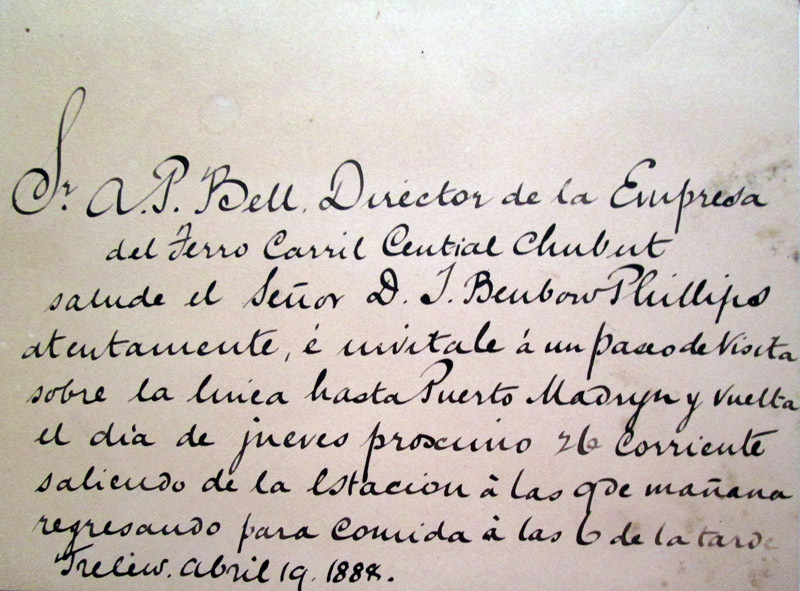 Asahel Pilkington Bell was the chief engineer and a director of the company. As well as his strictly railway-oriented duties Bell found time to embark on explorations further west with a view to opening up large areas of Patagonia to settlement and exploitation. Whilst I have no reports of his competence as an engineer and surveyor, his conduct during his 1887 and 1889 expeditions to Tecka and the Esquel area seems to have been seriously criticized by the Welsh members of his party. He clearly treated the indians particularly badly, but seems to have had little more sympathy for the colonists (3). Bell's explorations led him to make a variety of proposals for the development of the region, and whilst few of them came directly to fruition one wonders whether it was his ideas for a transport network which indirectly and tortuously led to the 1922 proposals for a large narrow-gauge system all over Patagonia. Amongst his proposals was one for the construction of a railway right across to the Pacific. In 1886 the first sod was cut and construction proceeded until 1889. Under Bell were two local engineers at Cañadón Ivan (later Trelew) and Puerto Madryn. These were E. J. Williams as mentioned above and a W. A. Brown. Mr. Brown seems to have been more used to directing peones and had a harsh management style which was bitterly resented by the Welsh labourers (4). Fortunately Lloyd ap Iwan and Gutyn Ebrill working under him were better able to relate to the men. Many of the labourers had been signed up in Liverpool with promise of parcels of land to settle on when their three year contract was finished. They were not impressed to find that the promised plots at Kel-Kein further up the Río Chubut were of semi-desert scrub, or that their passage fares out had been deducted from their first wages. Captain Kennedy of HMS Ruby who visited the colony in May 1887 commented that one quarter of the workers had left and that the rest would have done so if they could (5). Eventually Engineer Williams was sent to Buenos Aires to sign up Italian workers. They seem to have been no more impressed but many of them did eventually settle on the coast, leading to a long-lasting rivalry between the mainly Italian town of Rawson and the Welsh communities such as Gaiman upstream. 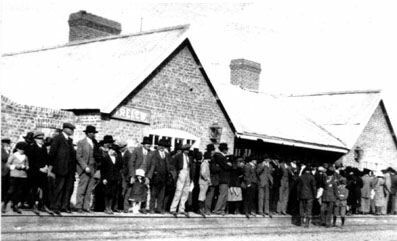 Slightly surprising is the fact that photographers were present at the meeting calling the strike by the workers during the construction of the railway in 1887. The track was made up of 42lb rails (20.8kgs per metre) laid on steel sleepers at 1200 per km (6). 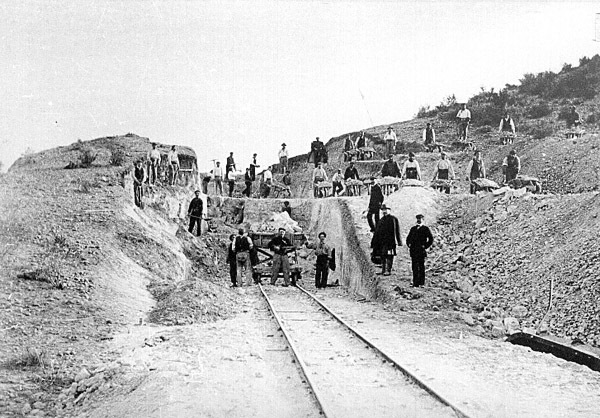 The railway company also built the first bridges across the Chubut at Dolavon, Gaiman and Pont Hendre (Trelew) to ease the passage of ox-wagons bringing wool and wheat to the railhead. Captain Kennedy also tried to foresee how the railway would operate once it was completed. He estimated that the works and equipment would have cost around £100,000. He comments that the colony's wheat exports were currently around 5,000 tons per year but were expected to rise to about 8,000, ie 80 trains at 100 tons per train; “which could hardly be deemed, even by the most sanguine, a very successful operation.” Passenger traffic he thought would be almost nil. 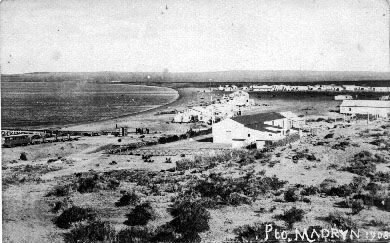 Puerto Madryn was a very small settlement when the railway began, and a far cry from the large town – almost a city – of today. 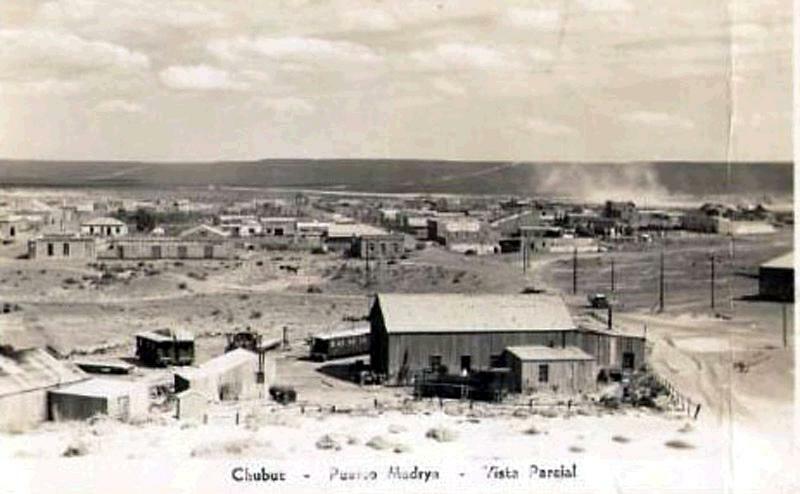 The postcard reproduced below shows the scattered buildings of Puerto Madryn in 1908, with wagons and a carriage visible to the left. 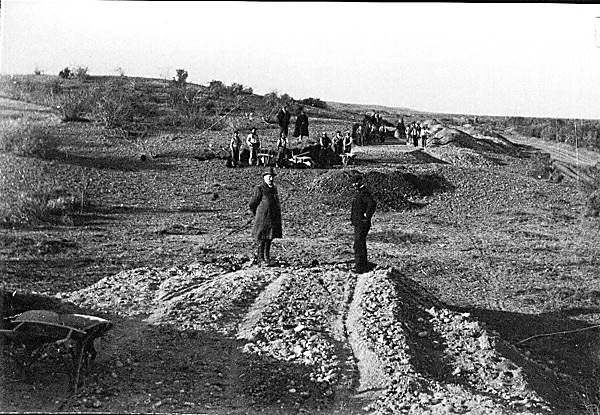 Héctor Guerreiro kindly provided this early view, before the construction of the new station or the Chubut Mercantile Company's building. It looks down from the raised ground at the Manager's House. In the foreground is the loco shed, with coaches and a loco around the turntable. The railway's starting point had a temporary station building for the first twenty years, and a jetty or muelle which could take vessels drawing fifteen feet at high tide. A train hauled by loco no. 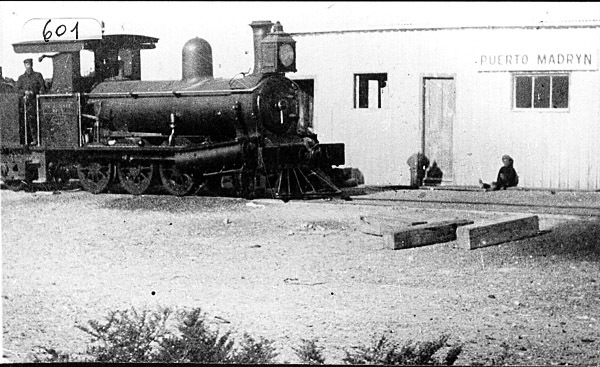 3 at the original Puerto Madryn station. The strange vehicle behind the loco crops up in several pictures. It is probably an extra water tank for the loco. A view from the west end of the building, with shadows showing that a train was standing in front of it. These views were found on the Bahía sin fondo blog spot. This view shows the opening of the original timber muelle with a Union flag very much in evidence. The lower one is a view of the original muelle, with in the background the new metal one now in use. A condition of the concession for the new muelle was that the old one should be completely removed, though a recent report suggests that the remains of piles can still be found at low tide. The railway winds up out of Puerto Madryn to reach the plateau or 'pampa' at about the km. 11 loop; it then runs almost straight south-south-west for 30 miles or so (50 km. ), and then drops back down steeply into the Chubut valley to reach Trelew. A detailed itinerary is given in an appendix to chapter 6. Click here to reach that page. The extract below is taken from a Chubut land-ownership map of the 1920s. The railway can be seen pursuing a winding route up out of Pto. Madryn before striking away south-west straight across the meseta. There is then another winding gradient down into Trelew. The intermediate station at Llyn Aaron (Aaron's lake) is clearly marked. This being the 1920s, the railway's later extensions to Gaiman and Est. Valle Superior (Dolavon) can be seen heading westward up the Chubut Valley. The lands allocated to the railway company alongside its initial route are explicitly labelled. Finally, the large plots of land to be sold for estancias out on the pampa contrast greatly with the small 'chacras' farmed on the Chubut floodplain. 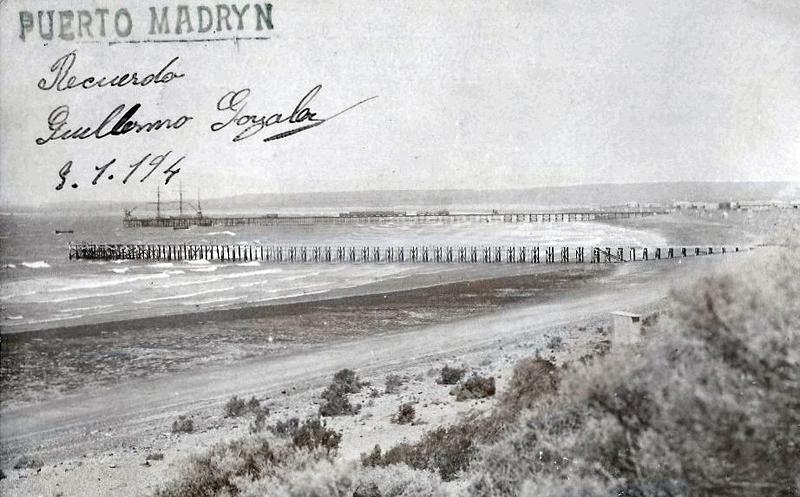 The story is told that the first through train from Puerto Madryn to Trelew made the 70 km journey in 75 minutes though the timetable eventually specified 135 minutes for the run. It appears however that the test train had been given banking assistance up to Km. 11 and had only comprised two wagons and a van. The new settlement at Cañadón Ivan was originally to have been named Llanfair, had not it been pointed out that this would be unpronouncable to the non-Welsh speakers. On 19th January 1887 therefore Congress authorized the creation of the town of 'Trelew' (ie. Tre Lewis Jones) on the site of the terminus at Cañadón Iván. 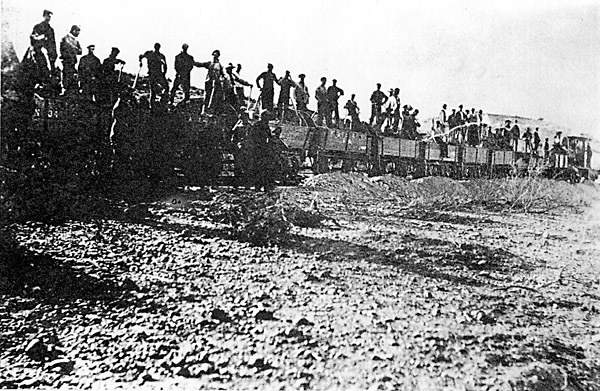 Four days later General Roca, later to be President of Argentina and himself with close though rather bloody links with Patagonia, visited the almost completed line and was hauled some distance by locomotive no. 2. This engine was subsequently named 'President Roca'. 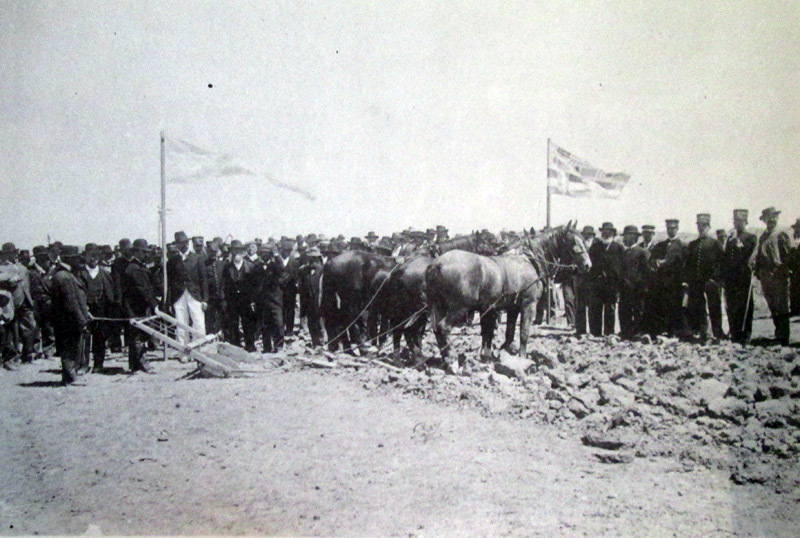 June 12th (or possibly July 1st) saw the opening of the line and the official incorporation of Trelew as a town. The next photo was taken during the preparations for the opening day, The loco is one of the two 0-4-2s and it can be seen that the train included a clerestory roof coach as well as those with low roofs. Why there should be a four-wheeled wagon behind the engine is not clear. 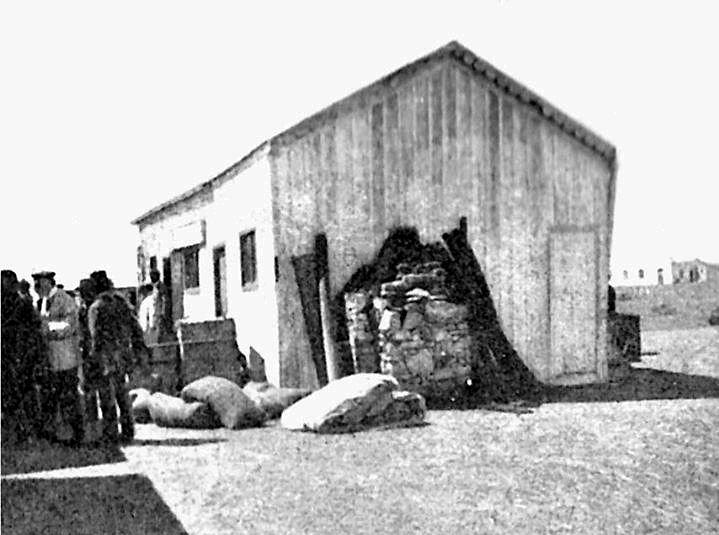 The railway built housing in Trelew for its workers. This line of cottages would have been at home in Wales were it not for its corrugated iron roof! These were eventually demolished. It is obvious from letters held by the Trelew Museo Regional that the company was already planning extensions even before the original line had been completed. 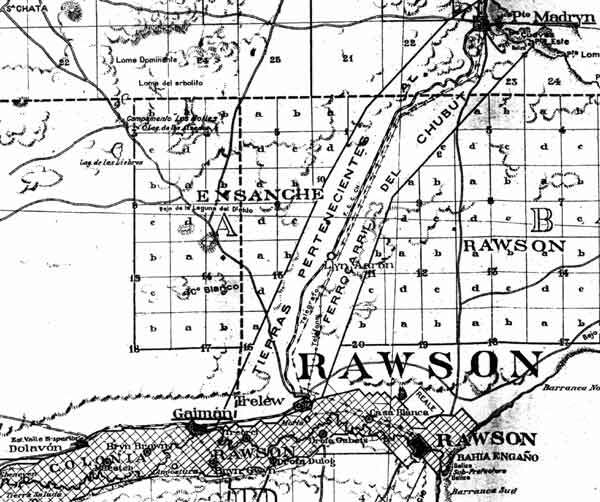 Correspondence dated December 31st 1888 and addressed to Governor Fontana proposed the exact locations of stations in Gaiman and Rawson. However in the event the former was not reached until 1909, and the latter not until the reconstruction in 1922. Scans and transcriptions of these letters can be viewed in an appendix page. 1 The Chubut Company statutory returns to the Board of Trade. Folder BT31/3691/22952 in The National Archives, Kew, London. 2 Railway in the Desert. Kenneth Skinner. 1984. Beechen Green Books, 22 Bantock Gardens, Wolverhampton. England. 3 Welsh Contributions to Exploration in Patagonia, Glyn Williams, in Geographical Journal, volume 135, 1969. 4 Railway in the Desert. As above. 5 Report of Captain Kennedy of HMS Ruby, 27 May 1887. Folder ADM147/1 in The National Archives, Kew, London. 6 Info from S. Damus. 7 Photo from collection of Museo Regional, Trelew. 8 Information kindly provided by Sylvester Damus.